Specialist for Steep Grades – Originally, the 10 class 85 heavy three-cylinder tank locomotives placed into service were built for the Höllentalbahn Line in the Black Forest, which was previously operated with costly and time-consuming cogwheel technology. The brawny class 85 units were able to master this difficult line exclusively with adhesion operation. There they turned out excellently until the conversion to electric motive power. Several of these athletic units then took on service on other German lines with steep grades such as Erkrath-Hochdahl until the end of their operation. Prototype: German Federal Railroad (DB) class 85 as it looked "on the pedestal" in Freiburg. Version with Witte smoke deflectors. Model: This is a reworked model with finely detailed, fully functional valve gear, imitations of brakes, sand pipes, and rail clearance devices. The locomotive also has smoke deflectors. The locomotive has a motor with a bell-shaped armature. Maintenance-free warm white LEDs are used for the lighting. The cab has window inserts. The locomotive has buffer warning stripes and painted boiler bands. 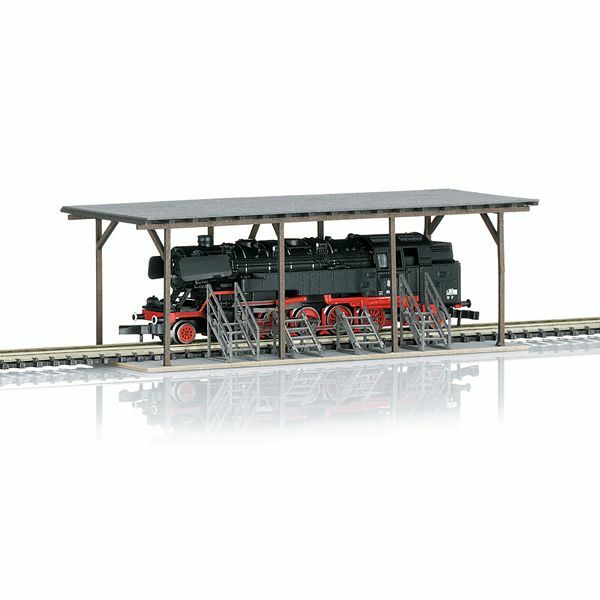 A reproduction of the locomotive shelter in Freiburg is included as a kit. Length over the buffers 74 mm / 2-7/8".